The Palace of the National Congress is one of the main symbols of the Brazilian State, with its twin towers flanked by the plenary domes of the Chamber of Deputies and the Federal Senate. It is front and back fenced by reflecting ponds and lawn. It is the biggest landscape architecture of Brasilia, housing thousands of people that work there or go there daily for professional interest or tourism. 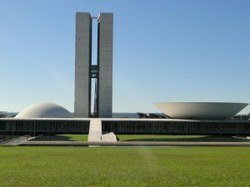 The Palace of the National Congress is the seat of the Legislative branch since 1960, the year that the Federal Capital was transferred from Rio de Janeiro to Brasilia. The National Congress project is signed by architect Oscar Niemeyer, who gave the building a monumental character, despite the simplicity of its geometric forms. The architect highlighted the Plenary Chamber of both houses of Parliament by erecting two domes above each one of them. The two towers of the building count 28 floors. They are the highest buildings in town. Niemeyer remarked, once, the convex and the concave structures as the most important features of the building. The convex form is the chamber of the Senate and the concave houses the Chamber floor.” The placement of the domes is merely for aesthetic purposes,” Niemeyer said. The Chamber floor is larger than the Senate’s because the number of Representatives is bigger than the number of Senators. In the Chamber, the architectural ensemble consists of the main building and four annexes, amouting 145,00 m². As a support to the activities of the elected representatives, there are in the interior of the Palace of the Congress almost all the administrative activities of a city, including restaurants, radio and TV stations, press, snack bars, barbershop, cinema, libraries, museums, art galleries and, namely, auditoriums of all sizes, where the composed by the Main Building and four Annexes, which makes a 145,000m² built area. Committees of the two Houses meet and where usually most of the out-of-the-Plenum events take place. Visitors usually arrive at the National Congress by the main entrance. By the front ramp, they go until the Black Hall, honor doorway of the National Congress and common area to the two Houses, where they are welcomed by the Public Relation personnel. During the visit, the public will know the Noble Hall, a place that houses some art works and is destined to the reception of foreign authorities, in official visit, by the Speaker. Afterwards, they will have access to the Green Hall, where they can appreciate various works of acclaimed artists that took part in the teem of Oscar Niemayer, architect of the Palace of the National Congress and of the city of Brasilia. Among the artistic works, there are Fragmento de Anjo (Angel Fragment), by Alfredo Ceschiatti; stained glass panel by Marianne Peretti; panel by Di Cavalcanti; partition pieces by Athos Bulcão; furnitures designed by Oscar Niemayer and Ana Maria Niemayer, and a garden designed by the landscape gardener Burle Marx. The Ulysses Guimarães Plenary Chamber (the House Floor) is the highest point of the visit, for it is the place where the discussed matters may become laws, that will modify the life of all Brazilians. In the Chamber's Museum the visitor will have the opportunity to revisit the Institution's history, with its roll to gather the representation of the Brazilian people. - Annex II, building that houses the Technical Committees, where the law projects are first analyzed. - Annex IV, where most part of the deputies' offices are located (on the tenth floor there is a restaurant with panoramic view of the Three Powers Square). - Corridors and belt conveyors, installed in the tunnel that connects the Annexed IV to the Annex II. From 9:30am to 5:30pm (groups leaving at each half hour) on weekdays, weekends and holidays. To access the Green Hall at session hours, men must wear suit and tie. Este conteúdo está inserido em um iframe. Se desejar tente a visualização livre do iframe.